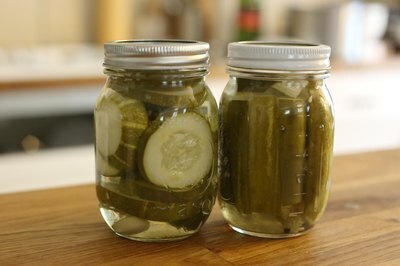 If your garden produces more cucumbers than you can eat, consider canning some to make homemade dill pickles. Pick fresh cucumbers when they are firm, dark green in color and covered with bumps, or warts; these will make the crispest dill pickles. When your pickles are done, add a decorative label to each jar with the date the pickles were made. These make great homemade gifts for friends and family, so make an extra batch or two to share. You might also like How to Make Bread-and-Butter Pickles -- no canning required! 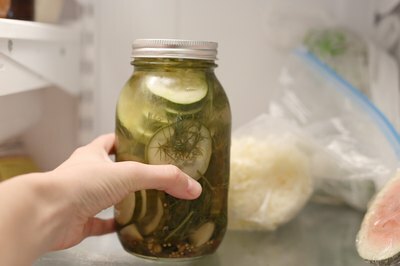 Make the pickling brine by mixing water, vinegar and pickling salt in the saucepan. Heat until the mixture comes to a boil. Wash the cucumbers thoroughly. Cut off the stems and cut a 1/4-inch slice from each end. 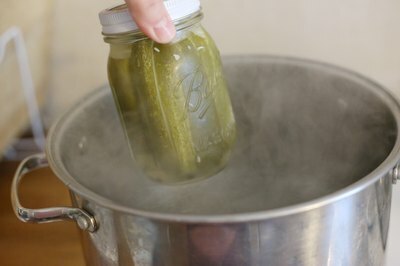 Place five to six cucumbers into each pint canning jar. 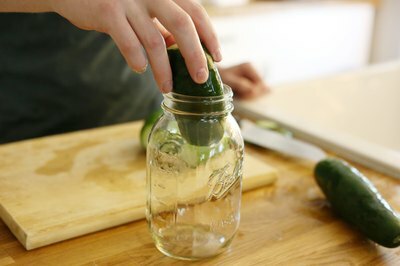 Leave 1/2 inch of headroom between the cucumbers and the top of the jar. Place 3 to 4 tsp. of the dill seed and 1/2 teaspoon of the mustard seed in each jar. 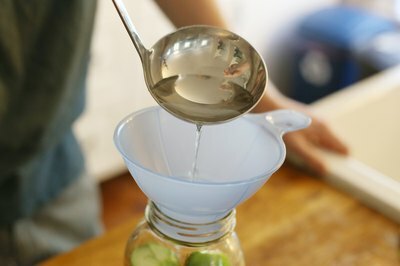 Place the funnel into the top of a jar. Ladle the brine carefully into the jar, filling it to within 1/2 inch of the top. Remove the funnel. Wipe the edge of the jar with a clean, damp paper towel. Place the seal and lid in place and tighten. Repeat with the remaining jars. Place the sealed jars into the boiling water in the canner. Make sure the jars do not touch each other. Cover the canner. Boil the jars for 10 minutes. Remove the jars from the canning bath and allow to cool. Let the sealed jars stand at room temperature for one week. They can then be stored up to one year in a cool, dark place. Once the sealed jars are opened, store them in the refrigerator.